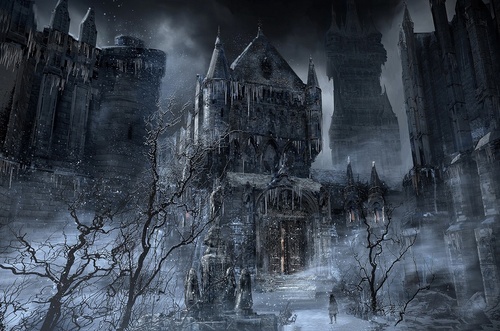 Now known as Forsaken Cainhurst Castle, it is a giant castle covered in ice. The noble family that once lived there disappeared without a trace. Its grand stature is visible from afar, even through the thick fog of the lake. The castle was the home of old nobles, once actively interacting with Yharnam, most notably as enemies of the Healing Church. They were bound by their bloodlines and their traditions, before being exterminated by the Executioners, and therefore ending their trades with Yharnam. The castle has since fallen into disrepair and is haunted by remnants of what once was. For more information, read the related Plot page: CLICK HERE. Martyr Logarius waits on the roof, guarding the secret entrance to the hall leading to the throne, where Annalise, Queen of the Vilebloods sits. "Ah, there's something I want to tell you. A bit of wisdom from the eminent Master Logarius!" "Once, a scholar betrayed his fellows at Byrgenwerth…and brought forbidden blood back with him to Cainhurst Castle." "It was there that the first of the inhuman Vilebloods was born." "The Vilebloods are fiendish creatures who threaten the purity of the Church's blood healing." "The Ruler of the Vilebloods is still alive today. And so, to honor my master's wishes, I search, for the path to Cainhurst Castle." "In his time, Master Logarius led his executioners into Cainhurst Castle to cleanse it of the Vilebloods." "But all did not go well and Master Logarius became a blessed anchor, guarding us from evil…Tragic, tragic times…that Master Logarius should be abandoned in the accursed domain of the Vilebloods." "I must free him, so that he may be properly honored in martyrdom." "Ah-hah! Is that… the sigil of Cainhurst?" "I've heard tell of Cainhurst nobles, and their amusingly pompous invitations." Visitor… Moon-scented hunter… I am Annalise, Queen of Castle Cainhurst. Ruler of the Vilebloods, and sworn enemy of the church. Yet, Our people are murdered, and We are prisoner to this wretched mask. We’ve tired of these piteous nights… Share in Our plight, and take oath against the church. If thou wouldst this path walk… …I prithee partake of my rotted blood. Drink deep of Our blood. Feel the spreading corruption burn. Now, thou’rt too a Vileblood. We two, the very last on this earth. We await thy return. For the honor of Cainhurst. An old blood-stained summons, inviting an honored guest to the forsaken Castle Cainhurst. Rather bafflingly, it is addressed to you. Do not hesitate; the stagecoach leaves from Hemwick crossing. Worn by the royal guards who protect Annalise, Queen of the Vilebloods at Cainhurst Castle. This paper-thin silver armor is said to deflect blood of ill-intent, and is what allows the royal guards to capture prey for their beloved Queen, so that one day, she may bear a Child of Blood. Adornment prized by the knights of Cainhurst. Resembles a ponytail of silver hair. The Cainhurst way is a mix of nostalgia and bombast. They take great pride even in the blood-stained corpses of beasts that they leave behind, confident that they will stand as examples of decadent. Attire of the knights of Cainhurst. A regal piece graved by intricate goldwork. The cainhurst way is a mix of nostalgia and bombast. They take great pride even in the blood-stained corpses of beasts that they leave behind. Confident that they will stand as examples of decadent art. Attire worn by the band of executioners commanded by the martyr Logarius. Later became the basis for all Church attire, with its heavy draping of Holy Shrawl. As the great Logarius said, "Acts of goodness are not always wise, and acts of evil are not always foolish. But regardless. We shall always strive to be good.